Last year I prototyped some early work around the Landscape of Trust: in 2017 I’m planning a major research project to build this work out further. The Landscape of Trust will explore how trusts sits within systems: the type of trust held between two individuals, the type of trust held within communities, the trust we hold in technology, and the type of trust held at an organisational level. It’s called the Landscape of Trust because the intention is to produce a map: a diagnostic tool to illustrate what trust means that each of us, and to each part of the system, and to hold meaningful conversations, and make meaningful interventions, to build trust. In other words, we will explore what trust means, and what we do about it. My intention is that this will be one of the largest such research projects available: global and diversified in terms of sector and culture, allowing us to baseline against different industries and communities. This week I’m working in Washington DC to build out the research methodology and protocol. It will fall broadly into three sections. In phase 1 we will gather a thousand narratives around trust to build out the landscape. These will fall at the highest level, exploring ‘what trust means to me’, and working down into subcategories, stories of how trust is earned, how it fractures, where it is held, and how it favours. Last year I gathered an initial 120 narrative accounts, and this work will build off that early sketch. The research approach will be a combination of large-scale open collection, and targeted closed groups to fill in the gaps, so some open research through Twitter and LinkedIn, and some closed groups within specific organisations and sectors. In phase 2 will build a prototype diagnostic: whilst in the first phase analysis will be manual, in the second phase will be looking for automation, and also visual approaches to representing the landscape, and app-based approaches to the diagnostic. Prototype this at scale, intending for at least 1000 open users, and within 10 organisations with at least a hundred participants in each. We will also explore cultural effects at this stage. The third phase will be about interventions: having prototyped a diagnostic that we can make increasingly robust, I’m particularly interested in how this can be used in a one-to-one context, within groups and teams, and at organisational level. At this stage I will also start to look at multiple language options and explore variance in those. Each of the three research phases will run for three months, so the Landscape of Trust research project will run throughout 2017 and I intend to #WorkOutLoud throughout the whole process. I will also be looking to recruit participants through this community. As the project comes together towards the end of the year I will start to work on a book to launch in 2018, but in the meantime I intend to enjoy the experience of exploration and discovery as we wander through the Landscape of Trust. 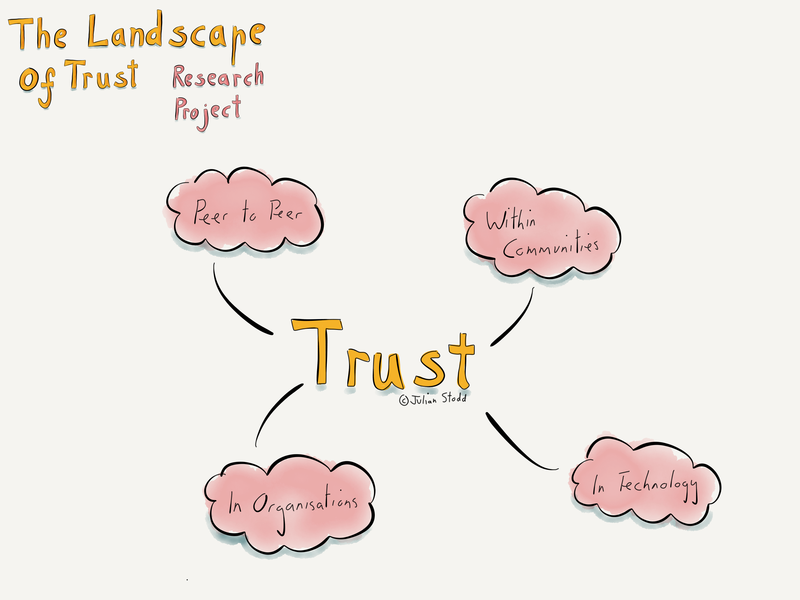 You can sign up to be involved in the Landscape of Trust research project here. This entry was posted in Trust and tagged Change, HR, Landscape of Trust, Leadership, Methodology, research, Social Leadership, Socially Dynamic Organisation, Trust. Bookmark the permalink. Sounds like a great heretical framework – and wonderful if you can get it funded. One thought – trust between communities seems to he to be a really important dimension that is missing. Especially in these times, we need to be able to understand and buil trust that can transcend intercommunity borders. Are you including thus in the research? Hope so. Such an important element if you are serious about sustainability and so easily destroyed if short term goals are pursued without the lens of trust applied. I’m really interested in trust between individuals and / or organizations or sectors or tribes or communities or institutions, similar to paulhodgkin, and how that’s different from trust between individuals.